PRODUCT DESCRIPTION: Yellow gel, syrupy or "loose" which comes in a syringe for application. Unique product in how it works. Basically, the main attractant, honeydew, is something carpenter-ants will readily accept as it is necessary for their young. When applied, the ants will find it quickly, gather up as much as they can, bring it back to their nests and distribute it to their young. The young will immediately eat it and their excrement will then in turn kill the entire nest! Within days, the nest will be dead. WHERE TO USE IT: Inside or outside. Where ant activity is highest. 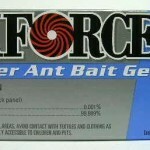 Apply it in the evening when carpenter ants get busy for the night. This will allow for quick acceptance and longer life of the product since extreme temperatures will break it down. It works! Initially it seems like the ants were eating it every night, then they seemed to stop and the bait would just dry up. Weeks later, I tried again with success and they were taking the bait. Now all the carpenter ants I see are walking around like they are drunk! It's definitely seems to be working. Wish I had more! Great product! Easy to use and when combined as suggested with products like Drione and Phantom spray it really does a good job. Very pleased with overall results.